Contents: Rice. It looks like there might be more there, in the bowl, I just can't make it out. Notes: Sad that they all have to share, can't be very sanitary either. Still, I'm sure they are the lucky ones, where many can't afford school. Looks like "domodo". It's a stew of tomato and peanuts over rice. Really populat. And eating all together like is the culture of Gambia. Like how Chinese people eat "family style". I hope they have a hand-washing rule. Picking food out of a common bowl with bare hands is just asking for spreading of germs. 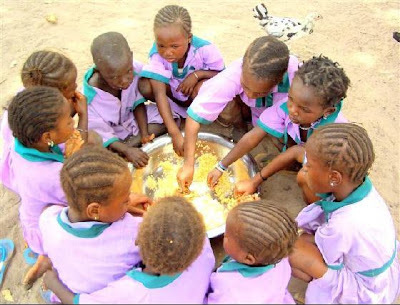 eating with the right hand is very common in africa and even into some parts of asia. some use dosa or other thin, spongy bread to scoop up the stews, sometimes just the hand. commonly only the right hand is used if I understand correctly. they are probably exposed to fewer germs eating from a common bowl than a u.s. student paying for cafeteria food with u.s. currency is--money is dirty! I'm from South America and since very little we know that one should wash their hands after handling money and before meals, even though we use cutlery; plus we have access to clean water and soap, therefore your assertion that those children showed in the picture are less exposed to germs isn't valid. I hope (but almost certainly not) they have washed their hands really well.